Humanizing the candidate experience is important because first impressions need to be great. We believe in providing compassionate customer service and that experience needs to start from the moment a potential candidate researches our company. John Turner serves as the HR Technology Analyst for Trilogy Health Services. Founded in 1997, Trilogy Health Services is a customer service focused provider of senior living and long-term healthcare services including independent and assisted living, memory care, skilled nursing and rehabilitative services. In his role, John oversees the systems and processes for the organization’s applicant tracking system, background screening, drug screening, reference checks, and other recruiting systems. John has been instrumental in bringing Trilogy’s recruiting efforts to the modern age. He has aided in creating an engaging candidate experience that has increased applicant flow during a time where unemployment in Healthcare is at an all time low. He has also been involved in providing new resources for recruiters that have helped them engage a larger reach of candidates while still maintaining one-on-one relationships. John has aided in automating several aspects of recruiting, that has allowed Hiring Managers to devote more time providing compassionate care to our residents. 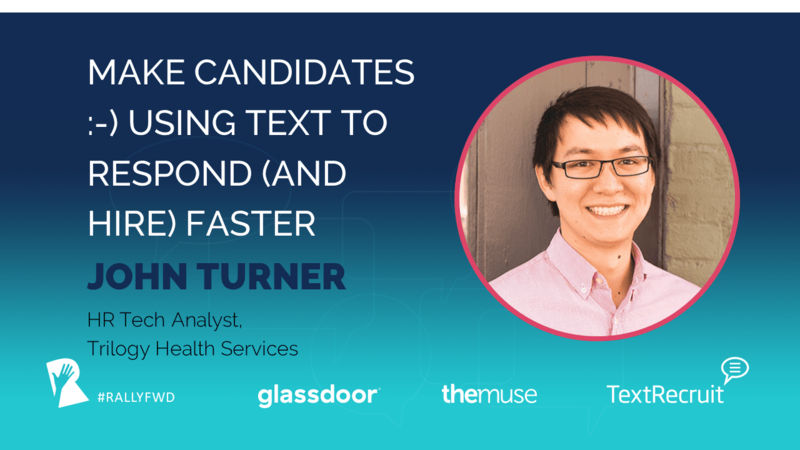 This is just the beginning for John as he continues to evaluate how HR technology can improve both the candidate and employee experience when recruiting, selecting, and pre-boarding. John is currently pursuing his Masters in Human Resources & Organizational Development at the University of Louisville. TextRecruit is a sponsor of Rally. Their sponsorship fee helps us to provide educational content and events on Recruitment Marketing.